Kautz digraphs K(d,l) are a well-known family of dense digraphs, widely studied as a good model for interconnection networks. Closely related with these, the cyclic Kautz CK(d,l) and the subKautz sK(d,2) digraphs were recently introduced by Böhmová, Huemer and the author. In this paper we propose a new method to obtain the complete spectra of subKautz sK(d,2) and cyclic Kautz CK(d,3) digraphs, for all d=3, through the Hoffman–McAndrew polynomial and regular partitions. This approach can be useful to find the spectra of other families of digraphs with high regularity. 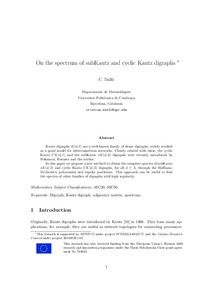 Dalfo, C. The spectra of subKautz and cyclic Kautz digraphs. "Linear algebra and its applications", 15 Octubre 2017, vol. 531, p. 210-219.